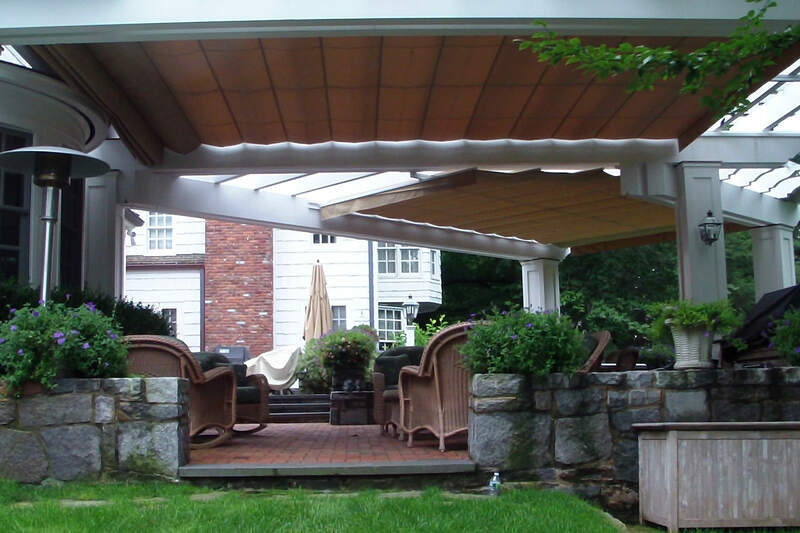 This project in was designed by Pogacnik Architects in New Canaan, Connecticut and is perhaps our most ambitious and impressive example of the ability of ShadeFX to cover irregular areas. We were sent the drawings in February of 2011 and set about integrating the canopies into the pergolas. 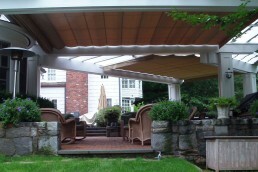 The irregular ‘corner cut’ canopy required special installation details that were easily accommodated by the pergola construction crew. 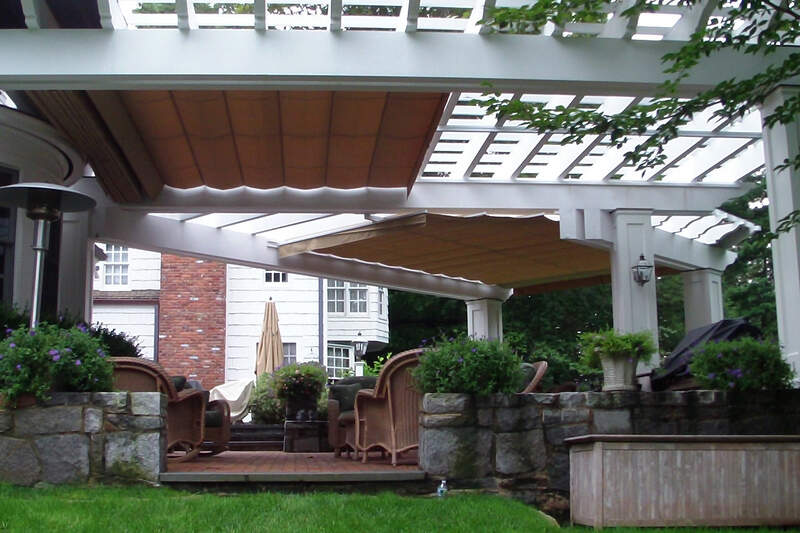 For that canopy, we specified both upper and lower stabilizers to run on just one side of the wings. This captured the ends of all the wings including the ones that didn’t come close to the other beam. With both upper and lower stabilizers on one side, the wings would normally drag on that one side. To create the offset, we used counterbalance weights inside the wings (hidden). 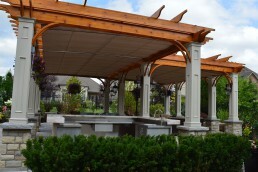 The scope of the project was extensive, and the pergolas were finally built in July, with the canopies installed in August. At the first push of the remote control button, both canopies extended smoothly, evenly, and effortlessly. 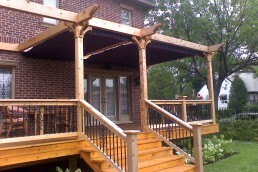 When it comes to outdoor living with style and comfort, this installation really sets the bar. 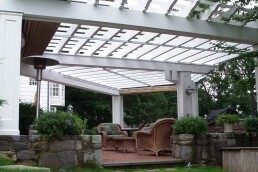 These homeowners wanted both sun and rain protection for two pergolas that intersected at an angle. 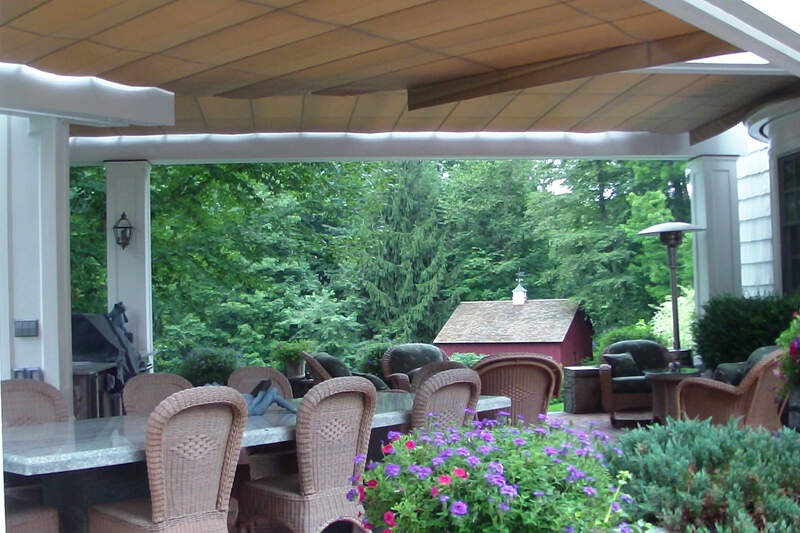 After extensive research into retractable awnings and canopies, the architect concluded ShadeFX was the only product capable of providing the solution needed.